Part of the Settings is the Account Details of which can be automatically filled after you signed up with DSM Tool. But you can also change it anytime you’d like depending on your preference. Let’s go over every part and discuss them. 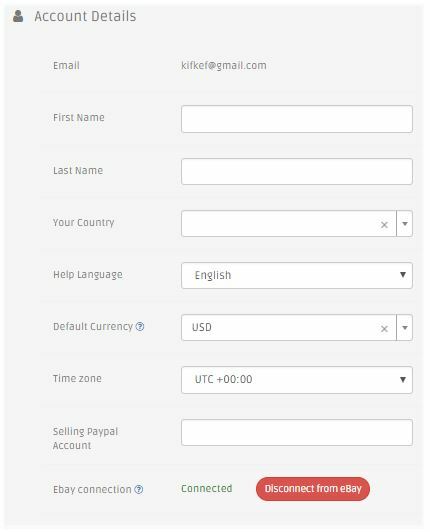 In the picture above, there is no option to change or edit your email address so either stay with it or if you want to change it then we suggest creating a new account. We made this option open for editing because others want to hide their real name for security purposes or if you just want to put a cool name for your account. You can also change the country depending on where you are located or if you moved overseas. Selecting your preferred currency will affect the currency around DSM Tool and we recommend to use the currency according to the market that you are targeting. For example: If you are selling on eBay UK from Amazon UK, then set the default currency to GBP. You can now set a time zone to your account, changing the timezone will affect the way your daily statistics are calculated and the rest of the times shown in your account. This way you can work at the timezone of your customers in the U.S, U.K, Germany etc. When it is connected, it means that your eBay and DSM account is properly connected and synchronized. Note: If you made some changes on this options, please make sure to click the “Update” button for the changes to take effect.